I have found myself acting as a single parent for a bit starting today. My lovely partner in crime has gone on a forest fire detail in West Virginia and has left me for the wolves. While I say this with a smirk on my face, we both full well know that although he may be digging trenches, standing amongst the roaring blazes of hundreds of degrees, and working 16 hour days, my job is well… harder. We always joke that never has my husband sat in the woods, curled up into a ball, and just cried (unless he is just not admitting it:). This does not happen often, but as all mamas of trying two-year olds and sleepless babes will admit; yes- yes, it does happen from time to time. Being that it is only the tip of the iceberg on my two-week adventure going solo, I understand that I am only at the beginnings of my ultimate test of patience. But, overall success has occurred I would admit. Healthy dinner with clean plate club? Check. Clean bodies and shiny teeth? Check. The Grinch who stole Christmas and countless other Christmas tales that we can’t get enough of read? (It should be a long Holiday Season) Check. Children snoozing oh so happily by seven p.m? Check. Sigh….. if only I had a glass of wine. The trials and tribulations of not having said husband to run to the package store and pick up a nice cozy bottle of red. Regardless, it has been my goal to keep my babes comfy as well as myself sans “man of the house”. This calls for some old-fashioned remedies. 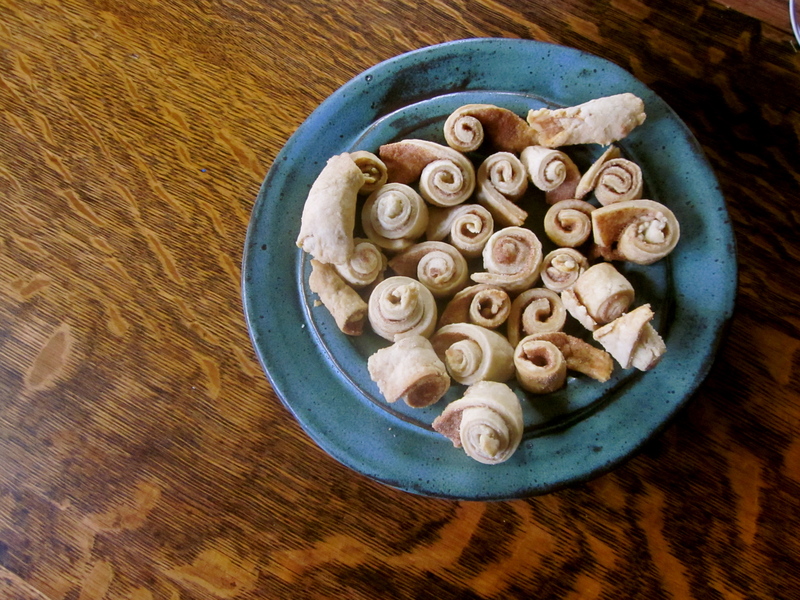 Something that always fills my heart up with nostalgic memories of family togetherness is my mama’s cinnamon roll ups. Made from extra pie crust dough they are a cinch and can be whipped up with out further ado. I happened to make a pumpkin pie a few days ago and had the dough in the old ice box fatefully waiting for a lonely moment calling for a carb load to ease my soul. This did the trick. Combing flour, baking powder, salt. mix well. Remove 1/2 cup of mix add ice water and stir till smooth. Cut butter into remaining flour until mixture resembles coarse meal and add flour water. Mix until well blended. Wrap into ball and refrigerate. You roll out the dough until it’s the thickness of a crepe or so, paint some butter on and sprinkle cinnamon sugar mixture all over. You slice it into about one inch strip,s roll ’em up and bake them at 375 for about 15 minutes. Then munch, crunch, yum…all afternoon. Enough to make you feel pretty dang good I’d say, (in my twangy-est southern accent with that). This entry was posted in food, traditions and tagged cinnamon roll ups, family togetherness, Grinch who stole christmas, pie dough. Bookmark the permalink.